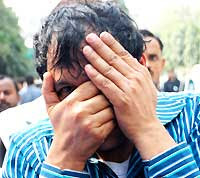 NEW DELHI: Delhi Police on Saturday claimed to have cracked a human trafficking racket, which sent over 100 people to the United States using forged documents in the past three years, with the arrests of three persons in the Capital. The racket used to allegedly target "innocent looking" people who used to queue up at the US embassy for applying for visas, offering the vulnerables their help in rectifying mistakes in supporting documents. This is one of the three biggest human trafficking racket cracked in the Capital in the last one year. Following a tip off, Additional Commissioner of Police (Crime Branch) Satyendra Garg told reporters, the arrests were made from various parts of Delhi on February 20. Ajay Shukla, the alleged kingpin who runs his office from a Safdarjung Hospital staff quarters, his associate Pawan Mishra and Gursahib Singh, a visa applicant, were caught by the special team of Delhi Police's Crime Branch, Garg said. Mishra was caught by the sleuths from Rohini in north-west Delhi and fake bank statements, authority letters, visa deposit slips, visa interview letters besides two original passports were allegedly recovered from him. His interrogation revealed Shukla's alleged involvement in the racket and based on the information provided by Mishra, Shukla was arrested from near American embassy in Chanakyapuri.